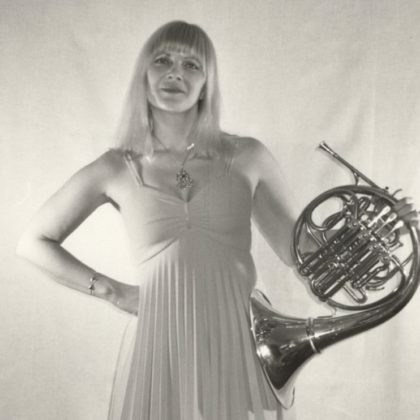 Kristina Mulholland is an active freelance French horn player and educator in the greater Philadelphia area. Some of her recent performances have included Symphony in C, Riverside Sinfonia, Patriot Brass, and Opera Delaware. In 2018, Kristina gave the Philadelphia premiere of Karl Stockhausen’s Nebadon. Her teaching engagements have spanned from private instruction to large ensemble rehearsal, from summer camp to general music, and from preschool through college-aged students. 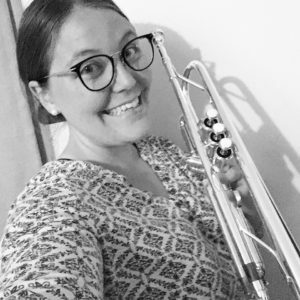 Ms. Mulholland received her Bachelors in Music Education from The College of New Jersey and her Masters and Artist Diploma in French Horn Performance from Temple University. Find out more about Kristina online at www.kristinamulholland.com. August 17th, 2017. 11:45am. After the initial intake process, including over an hour of trying to find a vein for an IV (one of the attempts literally bent the needle), it was time for the C-section of my breech baby. And just like that, at 12:10pm, 9 pounds and 7 ounces changed my life forever. It was the most terrifying, painful and longest day of my life. But it turned out the doctor was right, it was also my happiest. New parents from all different career backgrounds know this feeling. A major shift in identity happens when you suddenly have a new, vulnerable, beautiful being to care for. A balance, compromise, redefinition of how things in life work happens in such a unique way for each person. Its virtually indescribable. I found this balance to be especially difficult to navigate as a musician, educator, and wife of a musician/educator. Some of my personal internal struggles–How do I prioritize my family over teaching hundreds of other people’s children? How do I balance practicing and caring for my child? How do I deal with the guilt and anxiety of leaving my child with a babysitter? How do I balance income opportunities with childcare costs? How can I be the best version of myself for my family and my career? What matters most? This past year has not been easy but it has been worth it. I often find myself reflecting on a moment that happened playing a gig a few months before having my baby. An older gentleman came up to me after he found out I was pregnant and said, “just promise me you’ll keep playing.” At first I was offended. Playing horn is such a large part of my identity. Who is this person to assume that I have chosen to completely abandon my career once the baby arrives? Then I reminded myself that I am so incredibly fortunate to live during a time when, as a female, balancing a performance career and a family is even an option. Today’s post is written by our very own Kate Amrine who is gearing up for a busy fall semester of teaching and performing. We believe today’s post will appeal to all fellow Brass Chicks, regardless of career status and direction. Enjoy! 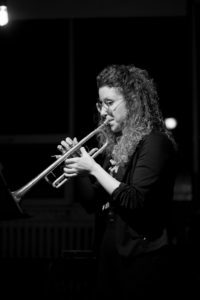 This week’s Five Things Friday post was written by trumpet player and composer, Megan DeJarnett. Megan DeJarnett is a Los Angeles-based composer-trumpeter who has spent her life in the thrall of a good story. 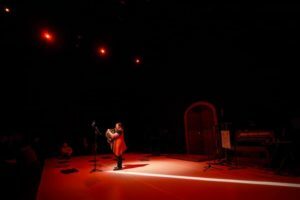 Throughout her musical training, she has prioritized communication – the composer telling a story to the performer or audience through the score, the performer commenting on the music aurally or visually, and the audience’s response to a piece all figure prominently in her creative practice. Megan has dedicated herself to the creation and performance of new music, collaborating with composers around the world as a soloist and a co-founder of Phantom Collective, a student-run chamber brass ensemble at CalArts. She has premiered new works across the United States, including at the 2016 National Trumpet Competition, and has studied trumpet with Edward Carroll and Matt Barbier. Megan’s creative work focuses on bridging the gaps between composer, performer, and audience through physical, idiomatic, and textual means. 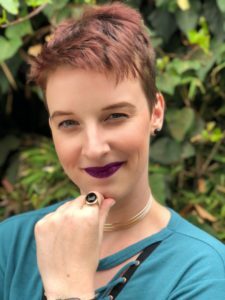 Megan holds a BM in Theory and Composition from Arizona State University and is currently in pursuit of her MFA in the Performer-Composer program at CalArts. She is constantly seeking out new collaborators; her work can be found at https://megandejarnett.com. Madison Lusby is a Junior at The Juilliard School School. She is the recipient of the Harry Aronson Scholarship and is a student of Raymond Mase. She attended Interlochen Arts Academy for her junior and senior year of high school studying with Ken Larson. 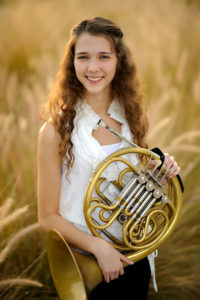 Maddi has been invited to compete in the National Trumpet Competition multiple times. In 2014, Maddi traveled to Beijing and Shanghai with her Interlochen Arts Academy Brass Quintet to perform at the Shanghai Conservatory. The quintet also completed in the Fischoff Chamber Music Competition. Maddi was selected for participation in the National Youth Orchestra of the United States of America. Following a residency at SUNY, NYO-USA toured the United States performing in world class venues including Carnegie Hall, Walt Disney Hall, and Ozawa Hall. As a student at Juilliard, Maddi had the privilege of attending/playing in masterclasses with David Krauss, Ethan Bensdorf, Louis Hanzlick, Kevin Cobb, Phil Smith, and Chris Martin. She has performed under the baton of Fabio Luisi , Alan Gilbert, Jeffery Milarsky, ​Pablo Heras-Casado, ​Robert Moody, Josep Caballé-Domenech, Yaniv Dinur, and Allen Tinkham. Maddi also performed with the New York Youth Symphony as principal trumpet on Mahler’s 2nd Symphony. Maddi attended Sewannee Summer Music Festival and studied with Pete Bond of the MET Orchestra. She also attended The Atlantic Brass Quintet Seminar, working with Sam Pilafian, Tom Bergeron, and Andrew Sord. Last summer she attended the Eastern Music Festival and studied with Jeff Kaye. Maddi is from Grapevine, Texas. She and her twin sister Sydney live in NYC during the school year. This week’s Five Things Friday post was written by trumpet player Karlynn Charette! As the new school year approaches, we think these are great tips for undergrad students to keep in mind. Karlynn Charette is a Canadian trumpet player who has been playing since the age of 12. She spent pretty well all of her time during her high school years in the band room and was inspired by her high school music teacher, Murray McNeely, to follow in his footsteps. Now 25 years old, she has been studying music at post secondary institutions in Kingston, Ontario, Canada at St Lawrence College from 2011-2013 in the music and digital media program. She graduated with an Ontario College Diploma. Currently she is finishing up her Bachelor of Music degree at Queen’s University majoring on Trumpet and will be graduating this spring 2019. Karlynn is planning on applying to teachers college and working towards becoming a high school music teacher. She currently works two part time jobs at a Canadian Charity called Joe’s Musical Instrument Lending Library and a retail store called Canadian Tire. She is involved in her University Wind Ensemble, the Queen’s University Chamber Orchestra and recently joined the Lasalle Adult Summer band. 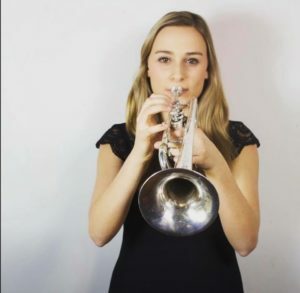 Karlynn recently completed her final year of trumpet lessons at the University with professor Dan Tremblay and she has written about her experience with tips and tricks on how to prepare for the recital day. Allison Lazur has explored various aspects of the arts, including work in the art of baking as well as life on stage as a performer. After obtaining a degree in the pastry arts from The Institute of Culinary Education in New York City, Allison baked for five years at various outlets throughout the tri-state area. She returned to school in 2011 to pursue life as a tubist, graduating with a degree in Tuba Performance from the Hartt School in West Hartford, CT.
Allison enjoys an active freelance career by performing with several groups including The New York Symphonic Arts Ensemble, Smiling Rhino Theatre and Chatham, New Jersey’s Community Players. In March 2015, she premiered a tuba concerto with the Hartford Independent Chamber Orchestra written by Charles Menoche at Central Connecticut State University. She is currently the instructor of tuba at Wesleyan University, while also keeping a small studio of private students. Her most recent endeavors include a 1920s Dixieland Jazz group, French 75, as well as currently being a member of the Hartford Independent Chamber Orchestra (HICO), which performs new music throughout the state of Connecticut. JoAnn Lamolino is the Associate Principal Trumpet of the Hawaii Symphony Orchestra following a successful national audition in February of 2018. She has performed with the Hawaii Symphony and the Honolulu Brass Quintet since the 2015-16 season. JoAnn is also a member of the Reading Symphony Orchestra in Reading, PA. For two seasons, she was a member of the Charleston Symphony Orchestra in SC. Additional performance highlights include the Baltimore Symphony, New Jersey Symphony, American Ballet Theatre, State of Mexico Symphony in Toluca, MX, Czech Radio Symphony, Adele, Josh Groban, Taoramina Arte in Taoramina, Sicily, Spoleto USA, and on Broadway shows. 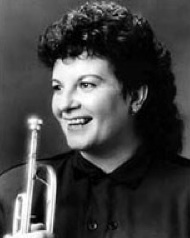 As a soloist, JoAnn has performed at the Trinity Concerts at One Series in Lower Manhattan, Bahamas Music Conservatory, RAI National Television of Italy, Charleston Symphony, throughout Europe with American Music Abroad and was a First Prize winner at the International Women’s Brass Conference. JoAnn received a Bachelor’s degree from Boston University and a Master’s degree in Orchestral Performance from the Manhattan School of Music. Principal teachers include members of the New York Philharmonic, Metropolitan Opera and the Boston Symphony Orchestra. Kaitlyn Resler, 22, born in Orlando, Florida, is a master’s degree student at The Juilliard School and a recipient of a Kovner fellowship. Ms. Resler also received her bachelor’s degree from The Juilliard School, where she studied with Julie Landsman. Ms. Resler is currently an active player with Wicked on Broadway, The Colorado Symphony, the American Ballet Theatre Orchestra and the Florida Orchestra. Kaitlyn is Co – Leader of eGALitarian – a brass ensemble of women musicians in NYC dedicated to improving and inspiring the lives of women in the community. Pit life is one of the most fun playing experiences I’ve ever had. But as we all know… it does often require a significant amount of downtime, often with nothing to do but dwell inside our crazy, beautiful minds! These are five things I realized about myself in the past few months while I had those endless hours of pit contemplation. 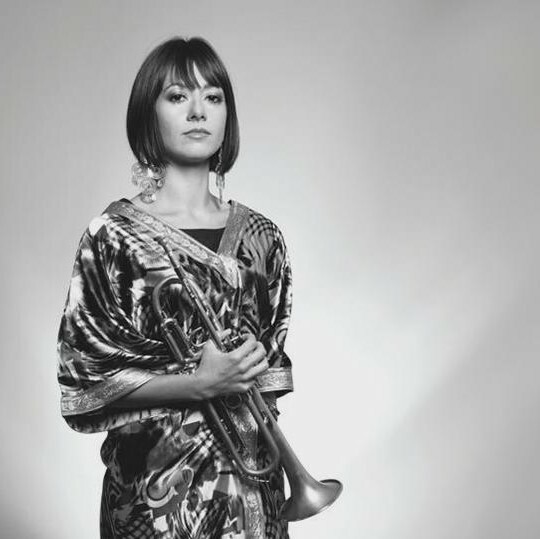 Émilie Fortin is a Montreal-based adventurous musician and teacher who explores every possible facet of the trumpet. A versatile performer, she is a freelancer for several ensembles and orchestras. She has contributed to the creation of more than a dozen works with various emerging composers in an effort to enrich the repertoire of her instrument. She currently plays with the Griffon Brass Band. Originally from Abitibi-Témiscamingue, she received a bachelor’s degree in classical performance with Lise Bouchard at the Université de Montréal. In the spring of 2017, she completed her Master’s degree at McGill University under the direction of Russell DeVuyst. Perfecting her craft with great masters, Émilie always seeks to excel in her personal practice. It is with this in mind that she has participated in brass workshops at Domaine Forget and Chosen Vale (Vermont). She was selected to be a member of the Montréal Contemporary Music Lab in the summer of 2016, as well as a participant for Soundscape Festival (Italy) in 2017 and for Banff’s Evolution Ensemble program for this summer. Firmly believing that pedagogy is an integral part of performance, Émilie is a teacher in various secondary schools in the region. She has also had the opportunity to teach the trombone, trumpet and music theory at an orphanage in Croix-des-Bouquets (Haïti). During the 2017-2018 season, she developed her focus on community engagement and teaching with The Global Leaders program, where she was one of 35 people selected for an international cohort of enterprising young musicians.